Like Santa here I have been a busy elf. The usual shopping and wrapping. General merry making. The baking has begun with two types of fudge and lots of cookies. We have parties on the 22nd, 24th and our own we are hosting on New Year's Eve. Anyone have a great appetizer for New Years? Trying to come up with lots of goodies for a big crowd. Now if I could just find something to wear. I won't start the baking until Sunday - if I bake now, I will eat too much. For New Year's we do a progressive dinner on our street and the entire neighborhood participates. It keeps us all off the roads. What a busy time of year! Enjoy it all. I love Christmas parties! 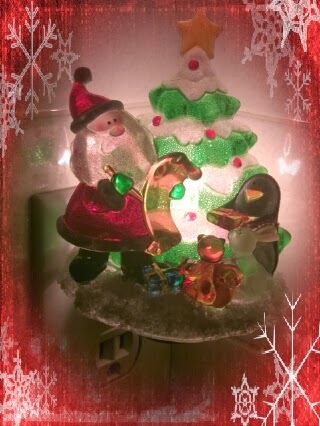 Cute little Santa display. I am not a party person... to go or to host...you're young though. My idea of a good time is going to bed early and watching a Christmas movie and doing some needlework. LOL! Lots of parties for you this season! How fun!! The hit around my house is stuffed mushrooms. They can be made up the day ahead and froze. Just pop in the oven when you need them. Good luck! et que ces quelques jours d'hiver soient des temps heureux ! I have some appetizers you might like. I'll email you some links! Your dining room is so festive, BTW…. I'm almost done, but I'm trying my hand at canning a persimmon/apple butter tomorrow for the adults in our lives….Please pray that I won't kill anyone! little smokies-bacon-and brown sugar. I PROMISE you cannot eat JUST ONE! You've been busy! If you are looking for an easy main dish recipe for a New Year's buffet, I recently posted (Dec. 1st)our favorite chili recipe...easy (crock pot), healthy, delicious, and serves a lot of people. Great on a cold night. We'll be the hosts on Christmas afternoon so I'm following your comments for appetizer ideas I can steal! My shrimp canapes are delicious. Everyone always asks for the recipe. You can make them ahead and freeze them and just pull them out of the bag the night of the party, put them on a cookie sheet frozen and broil for 5 minutes.